The email open rate is by far the most important metric of email marketing. According to statistics in 2017, the average open rate of emails is 24.7%. The open rate represents the number of people that opened your message. If your email sits in a subscriber’s inbox unread, well those don’t count because they are not getting any eyes on them. The goal of an email marketer is to get as many opens a possible. The higher your open rate is the more chances of clicks you get. The more clicks you get the more likely you will get sales. Of course, each and every one of us wants our business to be more profitable therefore we want to increase the performance of our email campaign. How do you know if your emails are getting opened? If you are a digital marketer most likely you are not sending off mass emails through Outlook or Gmail, but instead, you are using an Email Service Provider (ESP). When sending off a campaign you should have the goal in mind of increasing your average email open rate. An ESP is going to handle the tracking and reporting for you. Usually, the tracking doesn’t just provide details on how many opens you got, but can also tell you the number of clicks and who opened. The email tracking works through a tiny embedded invisible image inside of your HTML email. This is placed there by your ESP. Each campaign you send out will have a unique invisible image attached to it. Once your recipient opens your email and they have images turned on, then that image gets downloaded. Each time the image is downloaded it is considered as an open on the report. Keep in mind one user can open the message multiple times and with some ESPs, the multiple opens will get logged. If users have out of office auto responders turned on this usually does not cause an open in your reporting. One of the drawbacks to reporting is that it’s not highly accurate, and that is because it requires images to be turned on. This means if you are sending off a plain text email, then likely you won’t have much to report. It also means that your subscriber needs to have images turned on. Today, most email programs allow images by default unless the user decides to turn them off. With that being said, tracking your open rate is still the best way to gauge the success of your email campaign. What should you expect your email open rate to be? The answer is that it can vary by industry as a baseline. Then depending on your content, your open rate can be higher. According to a report from CampaignMonitor "Consumers are just slightly more inclined to open an email offering a discount (72%) than one with a personalized subject line (62%)." This means your open rates can be improved, it just takes some tweaking to understand what your audience responds to the best. 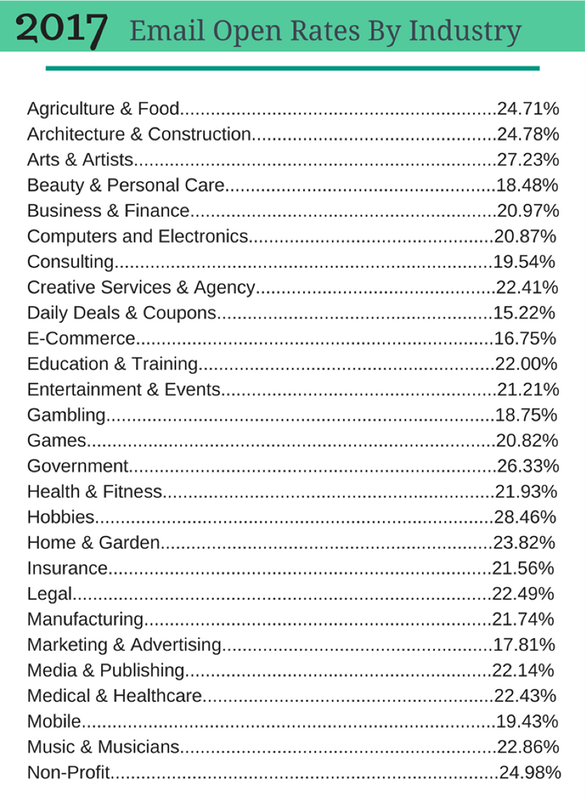 average open rates by industry. Email open rate trends over the years. Open rates by industry can vary over the years up and down like a roller coaster ride. For example, in 2016 according to Statista, the government industry had an 11.9% open rate, then in 2017, it's up to 26.33% according to MailChimp. However, there will always be variations in open rates. 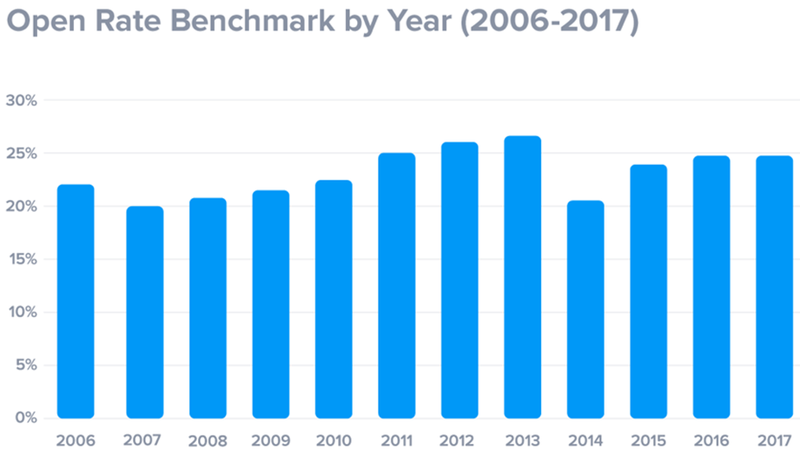 Take a look at this chart published by SuperOffice, it shows the trends of email open rates by year ranging from 2006 - 2017. These are some powerful insights. Email is still dominating the digital world. Email was on the rise since 2007 and then took a nose dive in 2014. Yet, we are now looking at growth and stability. How to start improving your open rate. 1. Don’t use purchased data. Digital marketers are often tempted to use purchase lists. In reality, many companies secretively succumb to that temptation. Buying data certainly comes with a lot of pitfalls. The biggest risk here is your email inbox deliverability. The problem with purchased lists is that the recipients are not familiar with who you are and why you are sending them emails. You will suffer more problems such as hard bounces, low open rates, increased spam complaints and potential blacklistings. 2. Don’t send to every email you collect. Clearly, not all email addresses you collect will be valid. Running into undeliverable email addresses and hard bounces will reduce your sender score. This is why email verifier tools exist to help you validate the email address before you allow it into your marketing funnel. Real-time email verification can add a layer of security to your site and your sending reputation. In addition to verifying all the data you collect, also make your users double-opt-in. This means that they are genuinely interested in the content that you are sending. Users who take the steps to complete the opt-in process will be more inclined to be engaged users. 3. Start segmenting your list. Think outside the box on how you can connect with your customers. Birthday emails, holiday emails, discount emails simply offer them things that make them feel unique. Take the time to learn more about your recipients. If you want to rise above the average email open rate you need to gain more data. Survey your subscribers, find out their likes and dislikes. Ask your audience “what do you want to hear about?” and listen to your answers. 4. Create captivating subject lines. There are many kinds of ways you can grab the users attention in a subject line. Some of the most popular ones are emails with urgency and ones with pain points. You have to create emotional subjects that will win them over enough to open. OptinMonster shows you 164 best email subject lines to boost your open rates. 5. Sending frequency and timing. If you are sending too often, customers will begin to get annoyed with you. Not only will they ignore your emails, they will generate spam complaints. Spam complaints lead to spam filters and that means your message will not even get seen. Find the right sending frequency that jives with your audience. The time of the day you also send out your emails impacts the average email open rates. 6. You must be mobile optimized. Over 50% of emails are now opened on mobile devices. If you are still not mobile optimized, you are hurting yourself. When creating your email template make it light-weight so that it does not take long to load on your user’s smart phone. Usually it’s the high-resolution images that increase the load time on slower 3g data connections. Slow loading emails can cause your users to avoid opening or simply deleting. Now that you have the knowledge of steps you can take to make your open rates awesome, start to put it to work. Start by cleaning your emails and learning more about your subscribers. Go the extra mile to build rapport with your list, and listen to what is important to your audience. hard bounces, reducing spam complaints and minimizing fraud.